Sunshine Canyon, Colorado. 7 a.m. A lean figure appears around the bend, moving rhythmically up the hill. A woman is running, her salt-and-pepper hair flowing past her shoulders. Her eyes are hidden behind sporty sunglasses and the brim of a purple running cap. Her expression is slightly strained from the effort, though the fluidity of her stride denotes no struggle. She nods and cracks a smile as she runs by me. She characterizes the quintessential long-distance runner–body honed for the craft, an air of indefatigable determination, ageless. Rima turned 70 last November, but you’d be hard pressed to know her age from the frequency of her runs up and down Sunshine Canyon. It’s a challenging ascent, a mix of pavement and dirt, gaining 3,000 feet in roughly 10 miles from the base on Mapleton Avenue in Boulder to her home on the outskirts of Gold Hill. She works as a hospice CNA in town and will often leave her car at the bottom of the canyon to train on the climb before starting her work day. I’m sitting at Rima’s home on a late winter morning, drinking peppermint tea. Her abode is a quaint two-bedroom, stone-and-wood cabin that she built herself. Large south-facing windows overlook Sugarloaf Mountain, with snow-covered Mount Evans on the distant horizon. Race medals hang from the walls, somehow blending in to the sanctity of the space. There’s no Internet up here, the place a true haven of tranquility. Rima is quite shy, and admits to not really liking talking about herself. As our conversation progresses though, she is more forthcoming with sharing her wisdom. Rima has been running for over 50 years, not her whole life, but the runner’s spirit was already in her from a young age. She hands me a photocopy of a poem she wrote when she was 10 years old. 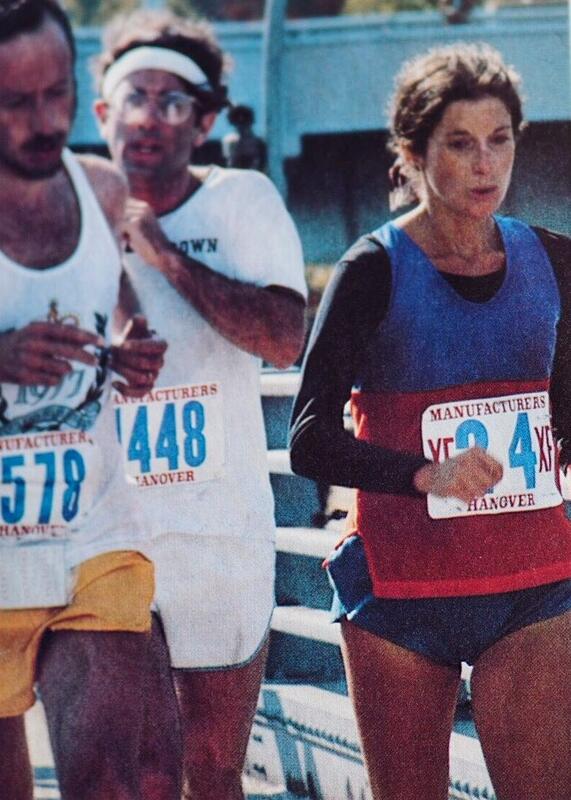 It wasn’t until 1977, in her late twenties, that she ran her first race, the Mt. 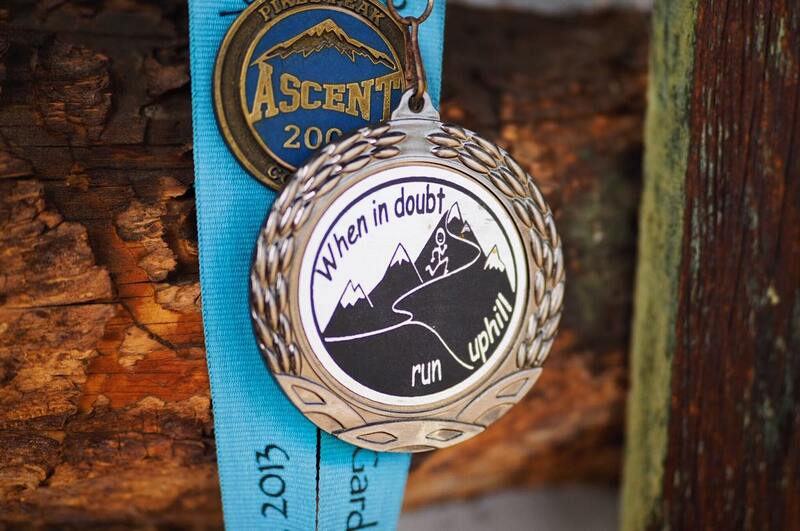 Evans Ascent, a 14.5-mile road race from Echo Lake at 10,600 feet to the top of Mount Evans at 14,265 feet. The Mt. Evans Ascent had an immediate impact on her as she shifted her focus from running mostly alone to wanting to take part in more events. She caught the racing bug and later that fall ran her first marathon in New York City. Rima does have a competitive side and surprised herself in those early days of racing, eyeing the competition at the start, an inclination she didn’t know she possessed. She still has that competitive drive and often checks the entry list of races to see who else is running in her age group. She doesn’t take it too seriously though, using the competition more as a motivator to keep her getting out the door. She is far more inspired by the places where she runs and the quality of the experience. Last year, she sustained the worst injury of her life. In a non-running-related accident, she fell and partially tore her hamstring, which caused severe swelling in her entire leg. She had been hoping to finish her first 50 miler at Grand Mesa 50 Mile in western Colorado in July, but the fall abruptly interrupted her training. Age and results are just numbers, not without significance, but playing a smaller role in her overall appreciation and dedication to the craft. This summer, she will again be returning to Grand Mesa to attempt the 50 miler. The race is just an excuse to keep getting out there, a good incentive to try to be as good as one can be. She smiles and her eyes brighten as she describes the beauty of the course, running along the Crag Crest Trail, on volcanic rock, overlooking more than 300 alpine lakes. Can running sometimes be like a moving prayer for you also? Do you find that, like Rima, if you keep showing up, you encounter those special moments? All photos by Joe Grant unless otherwise noted. Thank you. 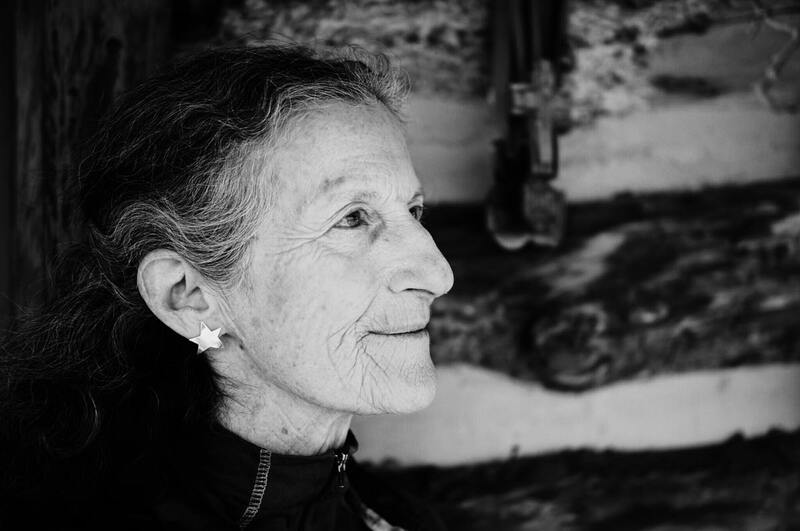 As a septuagenarian who runs trails regularly, and mostly now (though not intentionally) as a solitarian, I appreciate Rima’s story and your telling it. Moving through this world on my own two feet is a wonderful way to know and love life. Climbing a mountain trail (e.g., Colorado’s Bear Creek from Ouray to Engineer Pass) is a great spiritual gift to myself. Great piece. I agree with Rima whole heartedly on this. There is something very cathartic about running alone, especially in nature that swings my thoughts towards prayer. If you like this article you might check out this episode On Being did on Running a while ago. Oh my, I love this so much. Thank you for seeking Rima out and introducing her to all of us. I’m a 50 year old woman who has been running for 38 years, but only in the last decade or so have I really fallen in love with distance. I have no race history to speak of, and have only just started contemplated running my first ultra. I don’t have a lot of family or friends that I can look to for inspiration with respect to distance running. On the contrary, when I have told a scant few that I think running 50 miles during my 50th lap round the sun seems like a fitting thing to do, I’m met with “you’re too old,” “you’re going to injure yourself,” “you’re obsessed and taking this too far,” and all nay-saying you can imagine. Thank you again for Rima’s story. She is an inspiration. Thanks Joe for an excellent heartfelt testimonial of the very essence of running. Tomorrow I complete the 73rd year of my mortal sojourn, 60 of which I have been running, and this article makes a nice birthday gift. Good thoughts and prayers to you and Rima. Sweet little article – Rima’s spiritual, inspiring glow shines throughout. I’ll be 55 this spring, spend most of my time around people less than half my age (it’s a job thing), reading this makes me feel like the kid, at least another 20 yrs. of fun just out there waiting! We need more heroes like Rima! A pleasure to read! 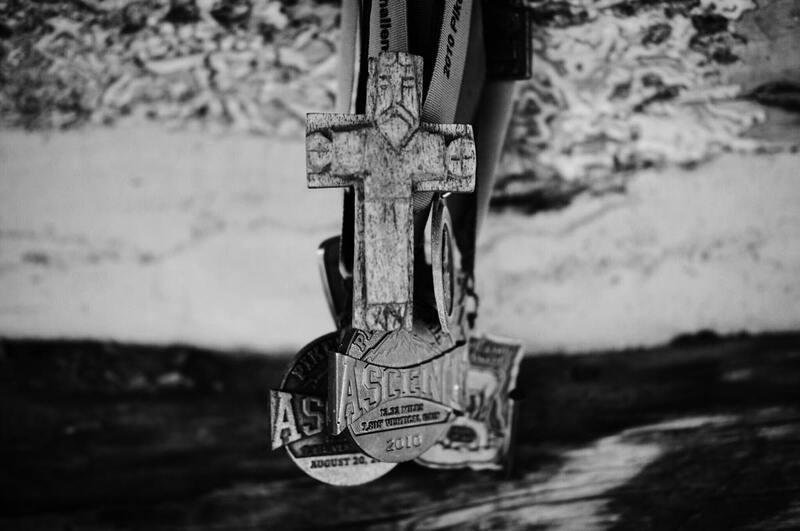 I love the pic of the cross adorning the medals. Indeed, as Rima says, “Running is like a moving prayer, offering yourself, a dance of praise.” I’m 59 and running my 8th 50 miler and 22nd ultra on Saturday. I always run with my rosary and folded prayers and scripture passages. Running is my time with God. When I run, I am not alone. God is with me. Every mile is made possible by Him, and my family. Through running I express my thanks and gratitude for many things and all my blessings, including recovery from a life-threatening surgical error (unrelated to running) that almost took my life shortly after I placed third OA in the women’s division of a 24 hour ultra. I returned the following year. This time, the run was part of my healing journey, and a run of thanksgiving and gratitude. You can read about it here: https://www.miriamdiazgilbert.com/single-post/2018/03/12/Come-What-May-I-Want-to-Run-How-Ultrarunning-Saved-My-Life When I run I pray for those in need, including my self, and I thank God for all my blessings. My ultra on Saturday will be part of my Lenten journey. In prayer, I’m dedicating this ultra to my pacer, crew, and best friend of almost 40 years – my husband Jon (married almost 33 years), who will start radiation soon. He’s been diagnosed with rectal cancer. Prayers and positive vibes welcomed! Ultrarunning, prayer, and my faith saved my life during my medical nightmare. Ultrarunning healed me and continues to keep me strong. Now, as I run I pray for my husband’s healing! Rima’s story is so inspirational. Thank you! And please, don’t delay your colonoscopy. thank you, that is beautiful.. These sentiments are so pertinent to those who run, regardless of age or competitive inclination. If the numbers are getting you down, work backwards and remember why we do it in the first place. Good call out Joe! I first met Rima when someone told me I had to see her house – very small, very neat, very all paid for – the opposite of all housing trends. Her only concern was the mountain lion looking in her window, eyeing her house cat. Since then it’s always a welcome sight seeing her tooling up Sunshine Canyon, and reading the passionate reports she sends me from her recent races, which inspire me because they are from events I’ve never run, like Monument Valley most recently. Excellent! Thanks for *seeing* an older runner. Sometimes they are invisible. As a runner in my 50s, I want to know that there are role models for me as I head north in years. Re: the On Being link suggested by Ben, I had the privilege of hearing Billy Mills speak before the Naatsis’aan Trail Ultra on the Navajo Nation October 2017, and his theme which stayed with me was that of running as healing broken souls. Special Easter Blessings for Miriam Diaz-Gilbert! Thanks for sharing your story of challenges and healing! You, and Jon, are in my prayers! This is Rima! I am overjoyed to see her recognized here for the spirit and inspiration she is. Her dance on this earth is such a gift and blessing. Thank you for honoring her, and the sacredness that runs thorough her. Love your story and all of the comments. I share many of the same sentiments. I love this story, Rima. You have been an inspiration for me over the many years I’ve known you! I, too, agree that running is a spiritual practice. I had the pleasure of meeting Rima and getting to hear a little of her story this past weekend at the Mt Taylor 50km in Grants, NM. At 70, she was the race’s oldest-ever female finisher, and 30 minutes after she finished, she got to welcome to the finish the race’s oldest-ever finisher, Kenneth O’Connor, just a few days shy of 80; it was pretty awesome. Rima is so very sweet, unassuming, and oh-so-tough!